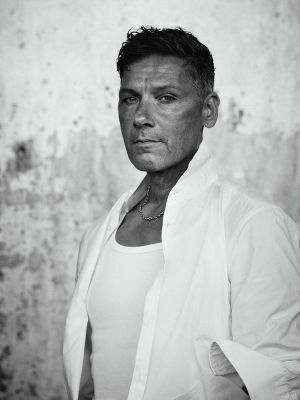 Christoph Schneider (born May 11th, 1966, East Berlin) is the drummer for the band Rammstein. Schneider was born in Pankow, East Berlin, East Germany. He has one sister, who is two years younger than him. Schneider left the gymnasium at age 16 and went on to work as a telecommunications assistant. In 1984, he served his national service with the East German Army; he is the only member of Rammstein to have served in the military. He married his then-girlfriend Ulrike Schmid in 2014. He is now called Christoph Schneider-Schmid. Schneider's parents wanted him to learn an instrument, so they sent him to a special school connected to a pioneering Socialist orchestra, where he was offered the choice between trumpet, clarinet, and trombone, out of which he chose the trumpet first because it was the easiest to play. He describes himself as very talented at playing the trumpet, and after a year he got into the orchestra and played concerts. It was here he became interested in playing the drums: he was impressed by the equipment and kept looking over his shoulder at the drumset while playing. He told his parents he wanted to learn to play the drums, but they weren't supportive of the idea because "they were both from the classical world". He would go home and practice with sticks and built his own drum set with tin cans and buckets. He bought his first drum kit at age 14, after which his parents had to accept it and let him rehearse and take lessons. In 1985, Schneider quit his telecommunication job to pursue his musical ambitions by studying music at university but failed to get into university twice, being rejected because he possessed no other musical skills such as playing the piano. He continued to learn to play himself. Schneider tried consistently from 1985 until 1990 to get into bands as a drummer, finally being successful with Die Firma. He currently uses and endorses Sabian cymbals and Sonor drum kits. He previously used and endorsed Tama Drums and Meinl Percussion cymbals. ↑ "Christoph "Doom" Schneider's Equipment". Rammsteinworld.com. http://en.rammsteinworld.com/rammstein/equipment/christoph-doom-schneider. Retrieved 30 May 2015. ↑ "SONOR welcomes Christoph Schneider (Rammstein)". Sonor. http://www.sonor.com/news/sonor-welcomes-christoph-schneider-rammstein/. Retrieved 30 May 2015.